Yesterday, the wineries on the San Gabriel Wine Trail hosted their "Winter Escape". 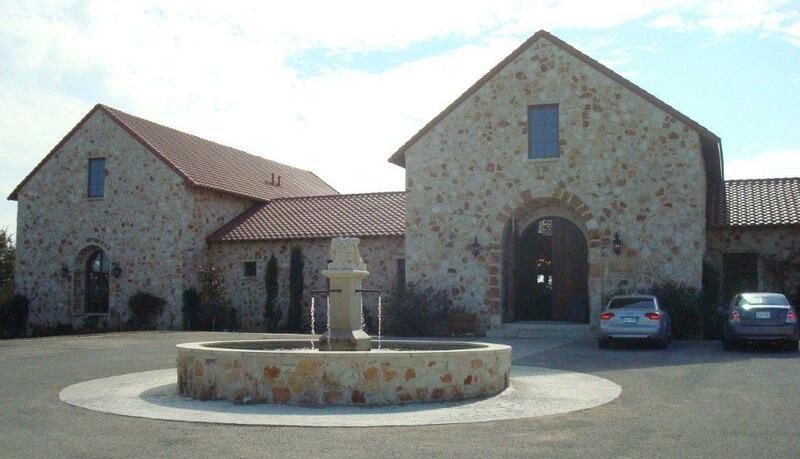 Wine lovers boarded buses, vans and limos to tour and taste the offerings at five Texas wineries and one wine bar. The crowd was estimated at well over 300 participants with each person receiving a souvenier glass, a wine bottle carrying bag and three tastings at each location complemented with free food pairings. Live music at two of the locations added to the fun. We started at Inwood Estates in Florence where Dan Gatlin, the proprietor, was on-site to answer questions and show the facility. 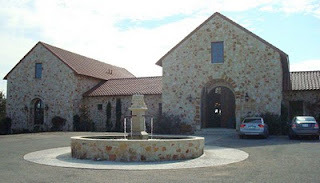 They have been making wine in Texas since 1981 and are well-known for their outstanding Tempranillo and Tempranillo blends. 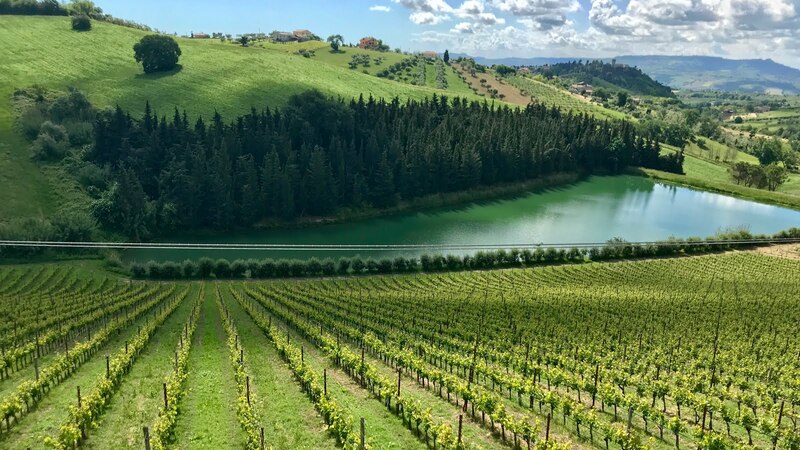 From here, we walked to the adjacent property, The Vineyard at Florence. Dan is the winemaker for this label, as well, for neighbor/owner Kambrah Garland and her partner Kris Davis. These ladies have created a beautiful space with their Villa Firenze. 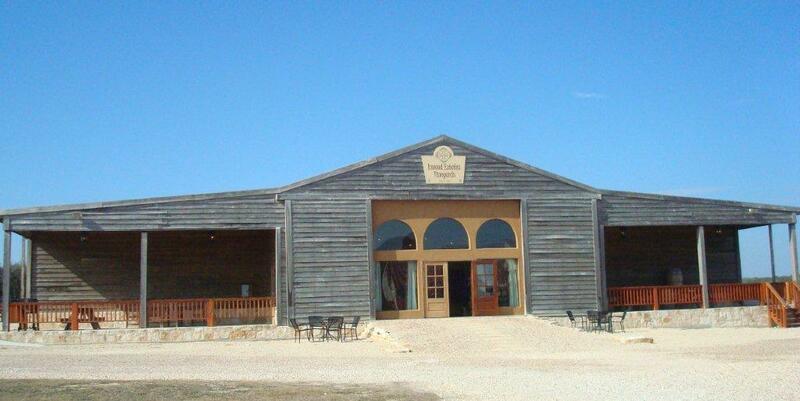 This building has a large tasting room, a cafe, spa, art gallery and event rooms. 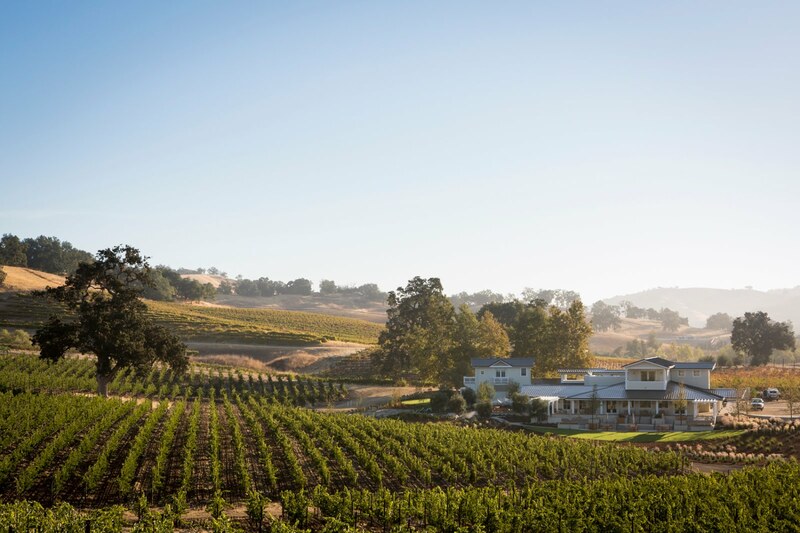 There are also free-standing villas overlooking the vineyards for overnight stays. 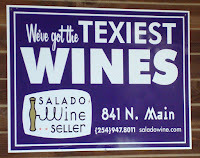 From here, we went to Salado Wine Company. 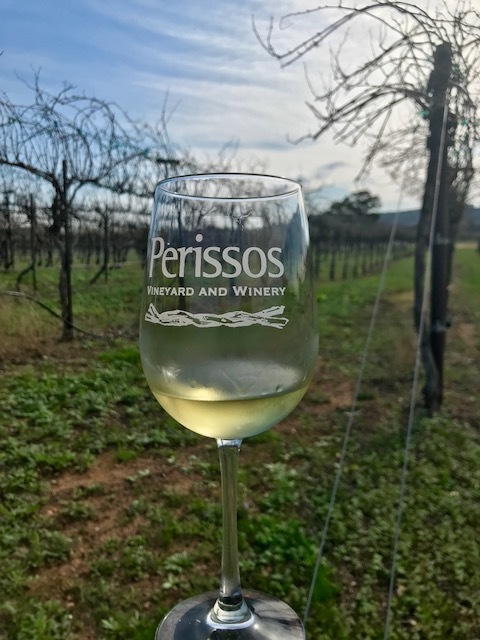 This is a new winery and they are still waiting for government approval for their labels so we were not able to sample their own wines. 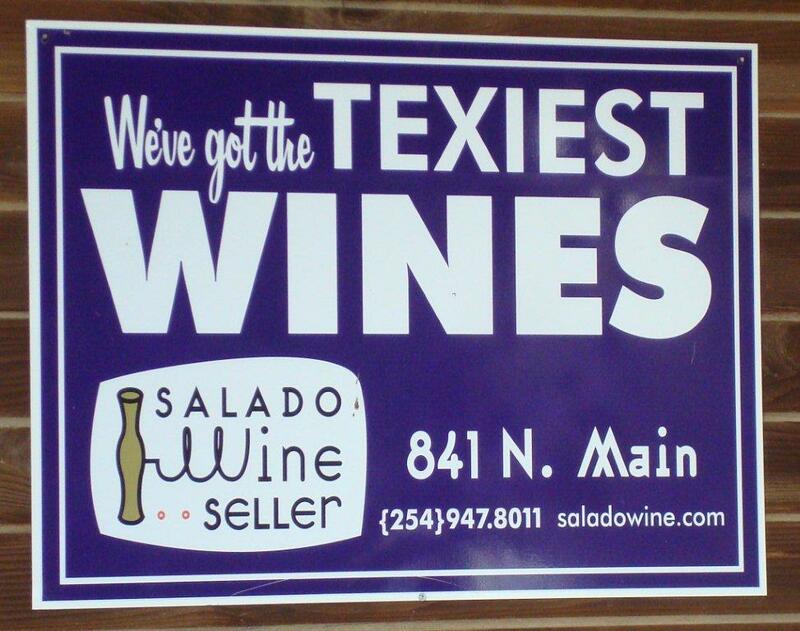 They instead served three wines from other Texas producers from their wine shop.﻿ The next stop was down the road at the Salado Creek Winery where we were offered a Pinot Grigio blend, Cabernet and a sweet red wine blend. Then it was time to head south to the Georgetown Winery. Winemaker and owner, Dan Marek, was there pouring his White Merlot, Cabernet and Chocolate-Cherry Port-styled wine. The Texas music was playing and the crowd was a rambunctious mix of locals and trail-goers. Our last stop was the Silver & Stone Restaurant and Wine Bar located on the 4th floor of a building in historic Georgetown. Groups of people from the wine trail took their final three tastings outside on the terrace patio with views of the town. The weather was fantastic, the trail-goers were excited to try the wines and a wonderful time was had by all with whom I spoke. I picked up this bottle of Seghesio 2008 Sonoma County Zinfandel at the grocery store for about $22. 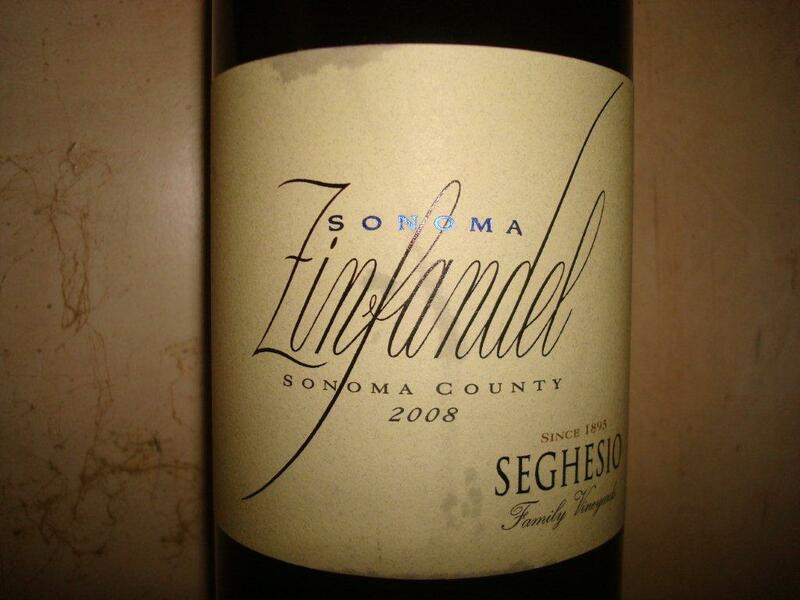 While I had not ever tried this particular version, I had tried most of their line at a Seghesio tasting at the Pappas Grill a while back and I had enjoyed all of their offerings. 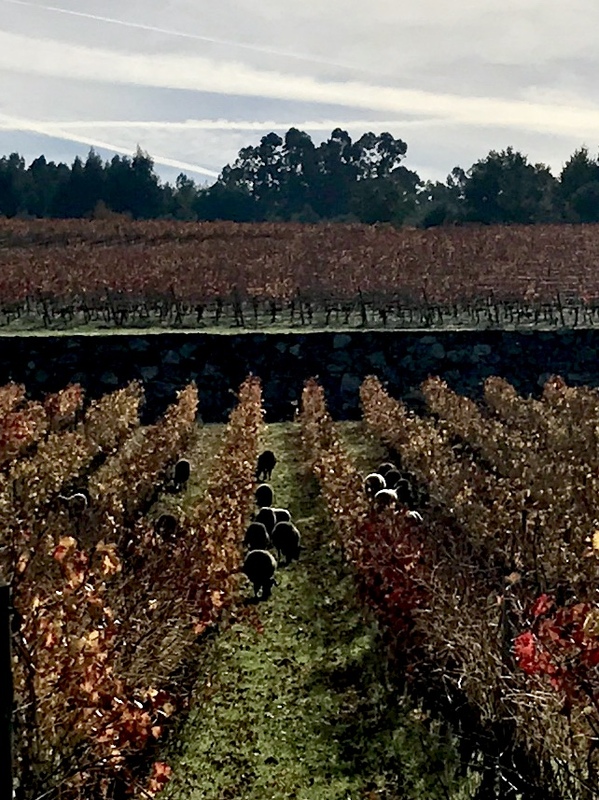 We kept the "Old Vines" Zin stocked at our house for several months afterwards for barbecue nights. In the glass, the wine was a clear, dark ruby right up to the rim. It had intense, fresh aromas of dark fruit and mixed berry with black tea and a bit of a floral note. 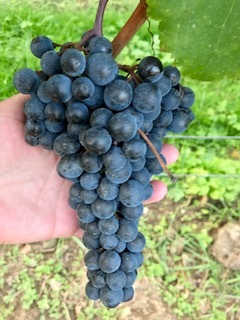 The flavors were more of the berry mix (blueberry, blackberry and raspberry) balanced with high alcohol (15.5% abv), smooth, medium tannins and medium+ acidity. It had a long, juicy finish with a bit of baking spice at the end. A very good wine at the price point. Last night, we went to Max's Wine Dive for dinner. It was busy as usual but we were lucky enough to get the last two seats at the bar. It has been chilly in Houston this week so we have been drinking red wine and eating a lot of meat. We decided to switch things up and ordered the fried chicken (all white meat) to split, after starting with a bowl of truffled mac & cheese. Instead of Champagne (the classic pairing for this meal at Max's), we went economical with a bottle of Schramsberg Blanc de Blanc. This classic California sparkler is consistently good. 100% Chardonnay made effervescent in the traditional method. Subtle citrus aromas with fresh-baked bread, a medium-body with a crisp acidity and a light lingering finish. It was excellent alone and even better with our dinner. We finished up with Warre's Otima 10 year Tawny Port and a Brown Betty apple dessert. This Port is a pale tawny color in the glass with intense aromas of honey and baked nuts. The sweetness is balanced with good acidity, high alcohol and a long caramel finish. Wonderful with the dessert but delicious alone as well. The perfect way to warm yourself on a chilly night. Another great night amongst many at Max's. 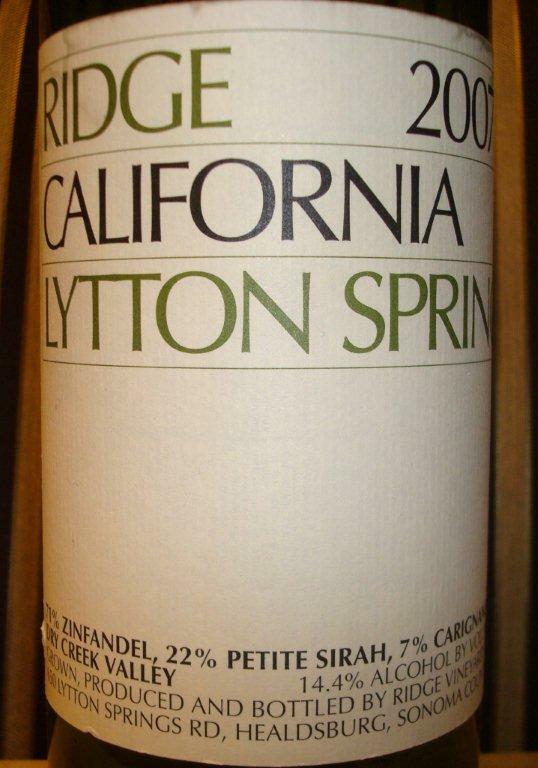 I roasted a pork tenderloin for dinner last night and decided to open a bottle of 2007 Ridge "Lytton Springs" red wine to serve with it. This wine is a blend of 71% Zinfandel, 22% Petite Sirah and 7% Carignane. In the glass, it was a clear ruby with a rosy-colored rim. It had fresh aromas of blackberry and cedar. It was full-bodied and well-balanced with 14.4% abv, medium acidity and medium tannins. Flavors were more of a mixed raspberry/blackberry with some spicy clove notes. It had a medium+ length, smooth, light fruity finish. Very easy drinking! Over the weekend, my husband and I went to Quattro at the Four Seasons Hotel in downtown Houston. They give you the option of dining in the wine bar with several small plate choices to share priced at $9 and under and a full restaurant menu as well. They have an extensive wine list with over 50 wines by the glass (all available in 3 or 6 ounce pours) and numerous additional bottle choices. We opted to sit in the main dining room and started our evening with a glass of Champagne and a shared lobster pasta dish which we followed with the Mozzarella Di Bufala antipasti that we used as a spread on the bread. We ordered a bottle of 2007 Provenance Cabernet from Rutherford to have after the Champagne with our entrees. The wine was fantastic; classic Napa Cabernet and reasonably priced. Executive Chef, Maurizio Ferrarese stopped by our table to discuss the menu options. I chose the filet and my husband chose the Osso Bucco. We finished with a glass of Tawny Port and Creme Brulee. Our server's name was Savdo (he is from Bosnia). We found him to be well-informed, charming and he provided us with excellent service. We thoroughly enjoyed our evening. 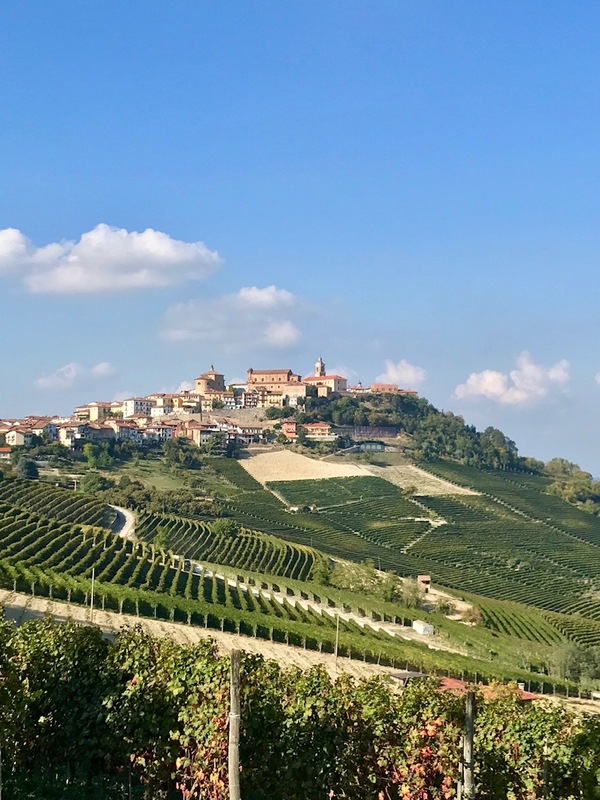 We learned that in addition to their bar menu and $4 Happy Hour specials, you can request some special chef-created options, all of which we are looking forward to trying in the enoteca the next time we venture downtown. I had family in from out of town and I knew we were going to take their kids to the Museum of Natural Science that afternoon so I was looking for an easy dinner for that evening. I ordered a pan of lasagna and bread with herbed olive oil from Carrabba's. I went to HEB to pick up some lettuce for a salad and decided to grab some wine while there. I was going to have seven adults so I wanted to get a few bottles of inexpensive Italian wine. 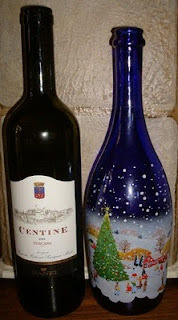 I decided to buy the $11 a bottle, 2008 Banfi Centine Red Table Wine which is a Tuscan blend of Sangiovese, Cabernet Sauvignon and Merlot. In the glass, it was a clear, light ruby color. It had clean moderately intense aromas of cherries and plums. It was medium-bodied, 13.5% abv, with smooth tannins and medium+ acidity. It had a light, red fruit finish. Overall, it was a well-balanced, easy-drinker that worked well with the lasagna and would be a great wine to keep on hand to have with pizza. I was able to easily feed 12 people well and serve wine to all the adults for about $100 with minimum effort. A good time was had by all and we finished up with a Christmas gift bottle of Moscato d’ Asti for dessert for which I took no tasting notes nor do I even know who was the producer… but the bottle is pretty cute. We had family over on a particularly mild evening so my husband was grilling ribeyes and marinated veggies for dinner and I had made a pan of scalloped potatoes to accompany it. 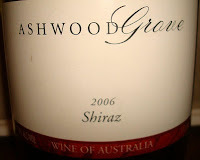 We had this magnum bottle of Australian 2006 Ashwood Grove Shiraz. It had been a gift and I didn't know much about it but the giver had felt it was a good value wine and I knew this group would be game to give it a go. It turned out to be a pretty easy-drinker and, of course, paired well with the grilled food. In the glass, it was a deep, dark ruby right up to the rim. It had intense ripe fruit aromas and flavors of plum and raspberry. Though not particularly complex, it was well-balanced, medium+bodied, with medium+tanins and acidity and had 14% abv. It had a medium length, pleasant, peppery finish. Everyone enjoyed it and the bottle was quickly emptied. 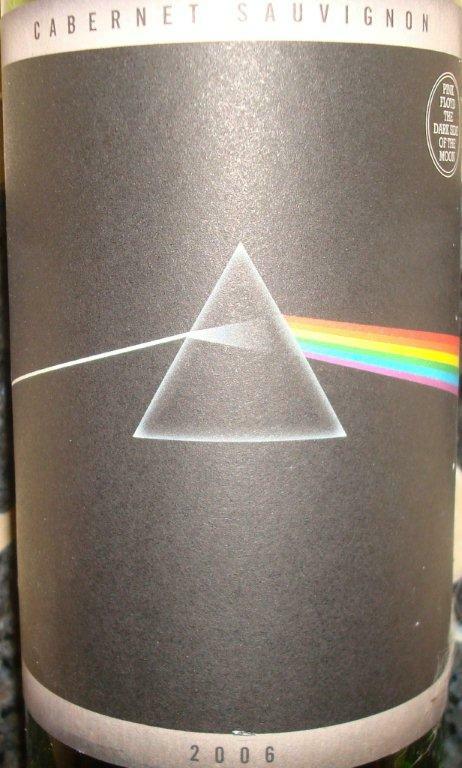 Looking for it on-line, I could not find a winery link but did see that the current 2008 release sells for about $17 for this size bottle and is available locally at Spec's. I would definitely give it another try, it was a good value wine and it would work particularly well for a large gathering. A busy day with my daughter yesterday had left me without a dinner plan and with no will to go out. We went into Whole Foods to search for inspiration before heading home. The guy behind the fish counter started chatting us up and offering samples. I ended up purchasing blue-crab stuffed salmon filets. This is the kind of thing that I never buy as I make great seafood stuffing but I was looking for convenience. I went to get a carton of milk while my daughter went to check out the beauty supplies. This (inadvertantly) led me through the wine section to get back to her. I got distracted and started looking for a particular Texas Viognier that I had been wanting to try (they were out of it), glanced over the Chardonnay and Pinot Noir sections (nothing grabbed me) and ended up looking at the Carmenere section which seemed to have expanded since I had last looked at it. My daughter came to find me at this point. 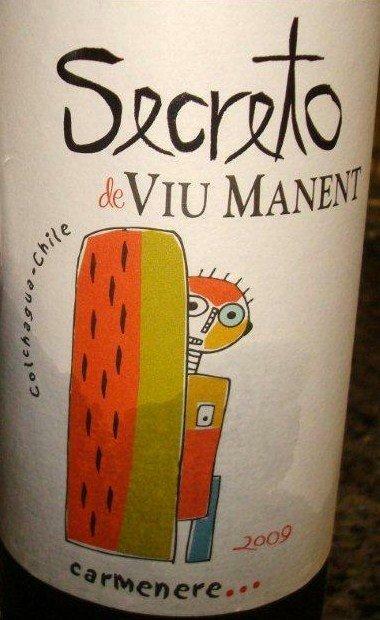 She saw the 2009 Secreto de Viu Manent Carmenere and commented on the label and said, "why don't you try that?" This is not how I usually pick wine but I looked at the $10 price and thought, why not. 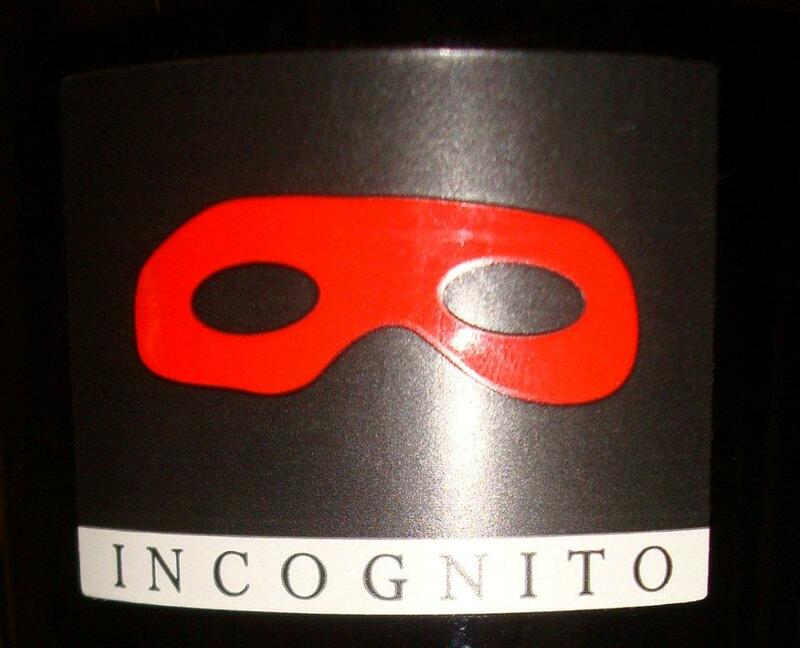 This wine came from the Colchagua Valley in Chile and is 85% Carmenere and 15% unnamed. It was an opaque purple with a ruby rim. It had medium-intense aromas of cherry, vanilla and cedar with fruit flavors of pomegranite and cherry with some vanilla. It was medium-bodied with medium tannins, 14.5% abv and medium+ acidity. It had a medium length, slightly sour cherry finish. While Carmenere is probably not the varietal I would pick to serve with this meal again (it wasn't bad together, nor was it special), I would try this with a cheeseburger if I had another bottle. A simple wine with a simple dnner. We began our New Year's Eve celebration with Ruinart Blanc de Blanc NV Champagne. We served it with a cold spread of salted almonds, organic potato chips with sea salt, mild cheddar and smoked swiss cheese and fresh raspberries and blackberries. Warm appetizers of crostini with chevre cheese melted on top, broiled shrimp in lemon butter and roasted potato skins topped with bacon, cheese and sour cream were brought out next. All of these worked wonderfully with this style of Champagne. In the glass, this wine was a pale gold color with endless bubbles. 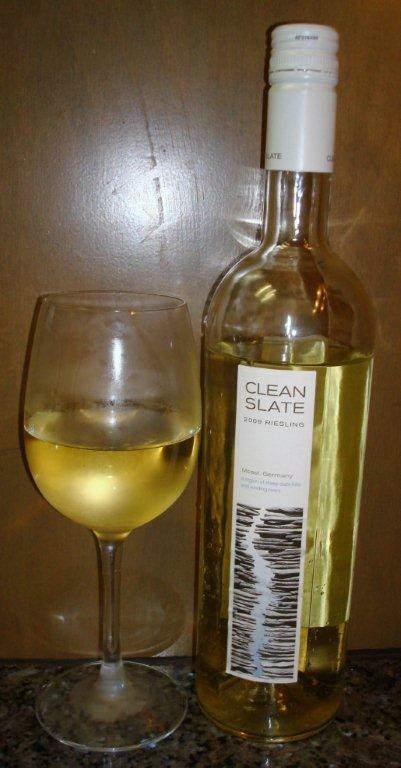 It had crisp aromas and flavors of peach, lemon and grapefruit which rounded out into a medium-length creamy finish. This course was followed with the Ruinart Brut Rose and broiled lobster tails with melted butter. In the glass, the Rose was a salmon-pink and equally effervescent. It had fresh, fruity aromas and flavors of raspberry, cherry and orange peel which ended with a medium-length, tart berry finish. After midnight, we finished the evening with large strawberries and melted dark chocolate for dipping. Absolutely delicious! 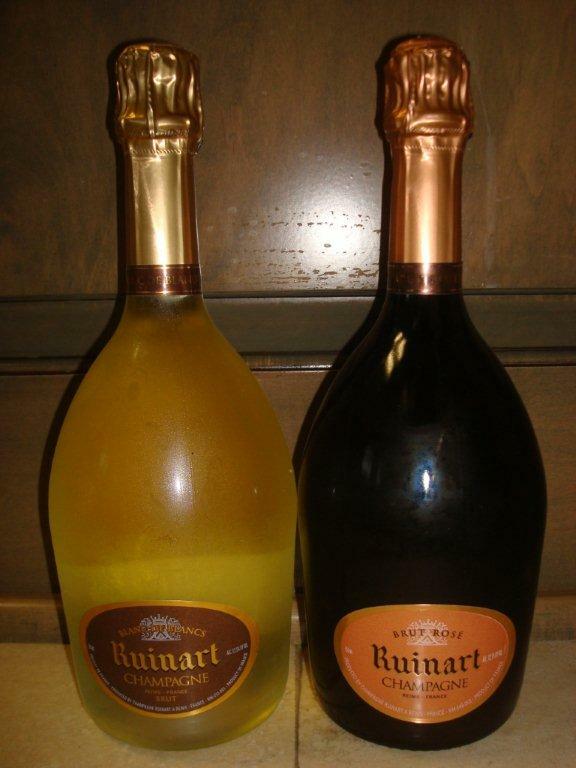 I think the antique bottle shape is what initially attracted us to the House of Ruinart Champagne. It always makes a unique impression upon serving but the quality of the contents is why we continue to purchase it.